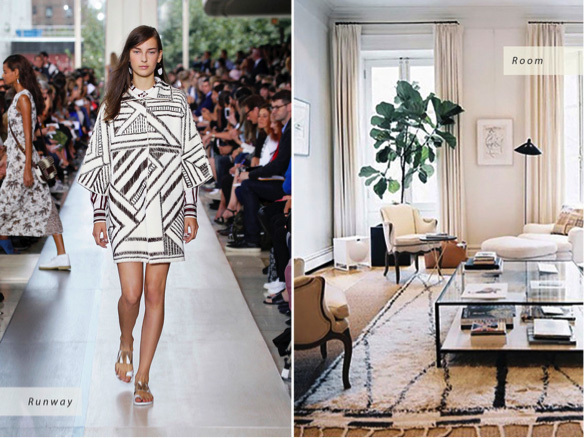 The pattern trend this season it seems as though its runway to room interiors are now being influenced by the different spring fashion trends. Style isn’t just for on the catwalk—the most well received colours and prints often find their way through the design world as well. 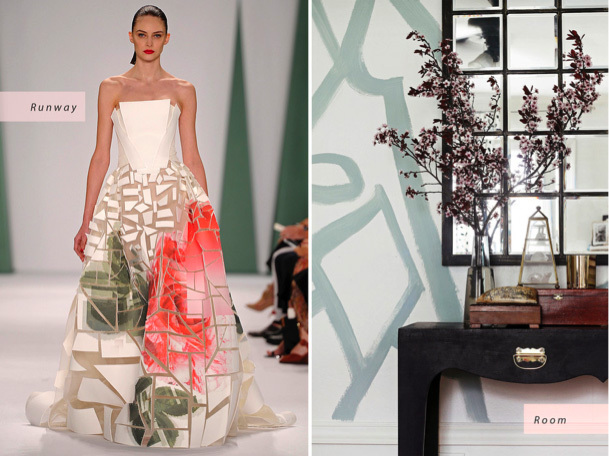 Carolina Herrera’s Spring 2015 collection perfectly combined traditional and modern style. Loose geometric lines are now starting to spread quickly through the interior world there are many different techniques that have been used across different interior but there have been a few interiors that have used hand-painted techniques, which really only requires a calming shade of paint and a little bit of imagination to create the perfect pattern for your interior. Prints that are nostalgic of a Moroccan pattern have always been popular in both the fashion and interior design worlds. Patterns that are a mix of lighter tones, for example a light ivory, and a darker tone, such as a dark brown, would work perfectly with a lot of different interiors. The bold pattern can definitely bring contrasting elements in a room together perfectly.